Georges Rouault was a modernist misfit. He was a figurative artist during a period that saw abstract art gain the ascendancy. He was a religious artist at a time when almost all advanced art was avowedly secular. And he dealt in allegory during an era that came to see allegory as, in Jorge Luis Borges's bald judgment, "an aesthetic mistake." And yet Rouault was very much at the center of the creative cauldron that was early modernism. He studied with Henri Matisse under the great symbolist Gustave Moreau in the 1890s. In 1903, he cofounded the Salon d'Automne, an annual exhibition in Paris that showcased some of the most radical art of the early 20th century. And he was peripherally associated with Fauvism, modernism's first bona fide movement. Thus, Rouault matters. And yet for a long time he has been ignored. The harsh judgments of such midcentury critics as Clement Greenberg (Rouault's reputation as "the one profoundly religious artist of our time," he wrote, was "one of the embarrassments of modernist art") left his reputation in tatters, and it's only recently, as stricter historical accounts of modernism have started to loosen up, that attempts have been made to salvage his reputation. I can imagine no more thorough and impressive salvage operation than "Mystic Masque: Semblance and Reality in Georges Rouault, 1871-1958" at Boston College's McMullen Museum of Art. Organized by Stephen Schloesser, a scholar long immersed in Rouault, and accompanied by an almost 600-page catalog with 34 essays, the exhibition of about 180 works is a production worthy of a major museum. Rouault emerges from it as difficult to love as ever (Greenberg's judgments were not entirely off the mark) but suddenly so much more interesting and complex than before. Given the mournful atmosphere of almost all his later imagery, it fits the legend that he should have been born into suffering, during the final days of the Paris Commune of 1871. This attempt to set up a republican democracy ended with 30,000 Parisians being slaughtered by a provisional French government that had reemerged after recently being crushed by invading Prussians. Dark days for France - and for Rouault's mother, who, according to Ambroise Vollard, later Rouault's dealer, gave birth to Georges in a state of shock after being rushed down to the cellar during a bombardment. Rouault's childhood was marred by poverty and despair. He was always a loner. As his interest in art developed, thanks in part to a print-collecting grandfather, he found himself drawn to art history's great founts of compassion - Rembrandt in particular - as well as contemporary scourges of social and political injustice, such as the caricaturist Honoré Daumier. Hypocrisy, dissemblance, false appearances: These themes came to preoccupy Rouault, and the exhibition traces the handful of repeating figures Rouault used to explore them. The first pictures that really catch your eye are paintings of prostitutes, clowns, and a "Christ Mocked," all in a skittering, inky-looking style. Painted between 1905 and 1908, they are electrifying works, full of pathos and a kind of anarchic undertow, as if appearances were caught up in a whirlwind and on the verge of flying apart entirely. You can feel the influence of Cezanne and Toulouse-Lautrec, particularly in the images of naked prostitutes. Perhaps most strikingly - because it puts them at odds with almost everything Rouault did later - all these paintings have a strong sculptural presence. The heads, some of them in three-quarter profile, seem to want to push out of the picture frame, the nudes twist powerfully in space, and you feel something almost ferociously anti-classical in the compositions. In choosing to paint clowns and, later, circus performers, Rouault was taking up a well-worn Romantic trope. He claimed the motif was suggested by personal experience (he saw an old clown by a roadside mending his "sparkling and gaudy costume" and was struck by the contradiction). But for well over a century, artists had been identifying themselves with the figure of the clown - the outsider who was in sympathy with the downtrodden and who saw through society's game of appearances. Likewise, it was Daumier's images of lawyers and judges that inspired Rouault to sketch in the courts at the Palais de Justice in 1907. Here again, it was the theater of false appearances that pulled at him, in particular the tragic divide he perceived between the cultivation of the appearance of justice and its harsh absence in reality. Of course, for a Catholic such as Rouault, Christ was the archetype of the misjudged criminal. If appearances were untrustworthy, it was his conviction that "at the heart of things, within individual experience of pain, pulses the one agony of Christ." Thus for him, the one true image is the face of Christ that, according to legend, was imprinted onto the veil used by Veronica to wipe the sweat of Christ as he made his way to Calvary. Interesting, then, that the first painting in the show is an oil sketch from 1891 of Christ being tended to - perhaps by Veronica - on the way to Calvary. The theme of Veronica's veil comes up repeatedly thereafter. In 1917, Vollard became Rouault's exclusive dealer. Vollard was also a publisher, and most of Rouault's energies in the 1920s went into producing illustrations for deluxe folio editions of books. For these, he developed a somber graphic language of thick, dark outlines, bodies compartmentalized into separate parts, and deep chiaroscuro. A lot of these works are in the Boston Public Library, which has responded to the McMullen's request by loaning more than 50 prints and illustrated books - an astonishingly rich trove. Along with a series of head portraits of Rouault's key literary and artistic heroes - Charles Baudelaire, Léon Bloy, Joris-Karl Huysmans, and Gustave Moreau - we get to see three series of prints from these years: etchings and wood engravings to accompany Vollard's satire of French colonialism in Africa, "Reincarnations of Father Ubu"; aquatints to go with a publication of Baudelaire's "Flowers of Evil"; and finally, a project dear to Rouault's heart over several decades, a series he called "Miserere et Guerre" ("Have Mercy and War"). It was in this series that Rouault set aside his instinct for caustic social satire and macabre, Baudelairean symbolism and let rip with a deeply felt, fastidiously conceived blast of religion. The images, dark and hieratic, are arranged in twos, threes, and fours and accompanied by text. One triptych, for instance, shows a despairing man, a foolish king, and a forlorn-looking circus performer accompanied, respectively, by the words: "Are we not all slaves?". . . "believing ourselves to be kings." "Who does not wear a mask?" Rouault returned to painting in the late 1920s - look out here for a hauntingly simple image called "Singer With a White Plume" - and worked on a series of circus performers in 1930 that combined centered, static figures with dull primary colors and dark, fluid outlines. The colors suddenly brightened in the mid '30s with a tremendous series of color etchings called "The Shooting Star Circus." But to suggest any affinity beyond coincidental association between Rouault and Fauves like Matisse, Derain, and Vlaminck seems erroneous to me. The quality of color and the purposes to which it was put are fundamentally at odds. Indeed, with his penchant for heavy black outlines, Rouault never really stops looking like a graphic artist, even in his paintings, which become increasingly claggy and encrusted in the late 1930s. That said, there are some wonderful works - tough yet beautiful, and utterly distinctive - in this last section of the show, and suggestive links between many of them. Several images of a suffering Christ have deliberate associations with the huge painting called "The Wounded Clown." A portrait of Veronica has the same simplicity and sense of contained beauty as another called "The Italian Woman" (shades of Camille Corot's late portraits of Italian peasants) as well as another, extraordinarily radiant image, made two years before his death, called "Sarah" (after the elderly and childless wife of Abraham who became pregnant despite her great age). Rouault could certainly be repetitive. There is more ugliness in his oeuvre than beauty, more soul-cramping constriction than liberating expansion. But I came out of this show convinced by the authenticity of his vision, and moved both by his tenacity and his genuine originality. 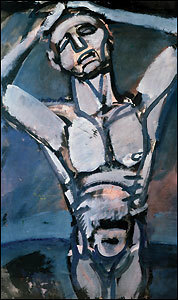 (Artists Rights Society) Georges Rouault's painting "Are we not all slaves?."